The Yankees are facing the Red Sox tonight for the first this season and of course it’s a Very Big Deal. Games between these two teams always get hyped up beyond belief. It is what it is. The Red Sox are hot (8-0 in their last eight games) and the Yankees are not (3-5 in their last eight games). Couldn’t think of a better series for the Yankees to turn things around after that yucky series with the Orioles. Anyway, we’ve got a premium pitching matchup tonight. Luis Severino vs. Chris Sale, both of whom finished in the top three of the Cy Young voting last year. These two actually squared off twice last season, and the Yankees won both games. 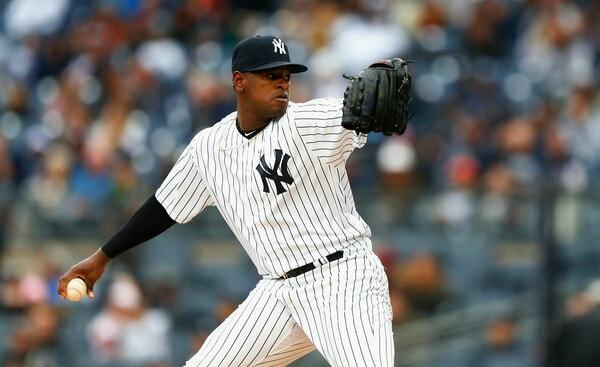 The Yankees went 3-1 in Severino starts against the Red Sox last year and also went 3-1 when facing Sale last year. Would be cool to see a repeat this year. Here are the starting lineups. The players are in for another cold game tonight. The temperatures will be in the low-30s all night and it’s pretty windy as well. At least the rain stopped. It rained in Boston for much of the afternoon. Miserable baseball weather. So it goes. Tonight’s series opener will begin a little after 7pm ET, and you’ll be able to watch on YES locally and ESPN nationally. Enjoy the ballgame. Roster Move: Robinson has been added to the roster, obviously. He’s in the lineup. Jace Peterson was designated for assignment to clear 25-man and 40-man roster space. The Yankees want the right-handed hitting natural outfielder on the roster against Sale and David Price these next two days instead of the left-handed hitting infielder-turned-outfielder. I’m guessing Peterson will clear waivers and accept the minor league assignment, and stay in the organization as a non-40-man roster player. Injury Update: CC Sabathia (hip) played catch today and said he’s been pain-free for a few days now. The next step is a bullpen session … Jacoby Ellsbury (oblique, hip) received a cortisone injection in the hip and the hope is he’ll be able to resume baseball activities Friday … Brandon Drury (migraines) went for a battery of tests yesterday and the Yankees are waiting for the results … Gary Sanchez (calf) is fine and could’ve caught today, but Aaron Boone decided to give him one more day away from catching as a precaution. Rotation Update: As expected, Sonny Gray will start Thursday’s series finale. He’ll be on normal rest thanks to yesterday’s off-day. That is Sabathia’s spot. The Yankees waited until this afternoon to officially announce Gray as Thursday’s starter for whatever reason.